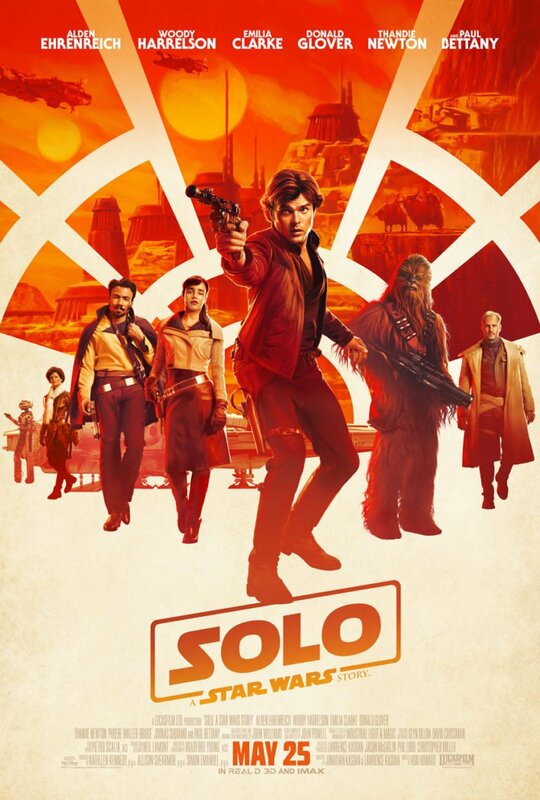 "Heroic Adventure Saga Delivers the Goods"
SOLO: A STAR WARS STORY is an origin story about the iconic hero Han Solo’s first adventures, including how he met Chewbacca, how he became owner of the Millennium Falcon, and how he got involved in his first big adventure. SOLO is like an exciting western in outer space, with outlaws, likeable scoundrels, menacing villains, mysterious women, and calculating good guys. SOLO has lots of heart, the plot points are on taarget, the actors look like they’re having fun, and Han and Chewbacca are often challenged to do the right thing. Caution is advised for some foul language, scary moments, and lots of laser battles. SOLO: A STAR WARS STORY is an origin story about the iconic hero Han Solo’s first adventures, including how he met Chewbacca, how he became owner of the Millennium Falcon, and how he got involved in his first big adventure. SOLO is like an exciting western in outer space, with outlaws, likeable scoundrels, menacing villains, mysterious women, and calculating good guys. SOLO has lots of heart, the plot points are spot on target, the actors look like they’re having fun, and Han and Chewbacca are often challenged to do the right thing. Caution is advised for some foul language, scary moments, and lots of laser battles. The movie opens on Han’s home world of Corellia. The world is run by criminals, who enslave the people, but on whom the evil Galactic Empire keeps close tabs. Han is about 19 and his girlfriend is named Qi’ra. Han dreams of escaping their criminal overlord, buying a ship and piloting their way across the galaxy, away from the Empire’s grip. They plan a daring escape, but during it, Qi’ra is trapped, and Han must escape without her. However, he promises to come back for her as soon as he can. To escape, Han signs up with the Empire to become a pilot, but Han doesn’t take orders well. So, three years later, he finds himself as an infantryman trapped in a muddy war on another planet. Han runs into a team of thieves headed by Beckett, who are posing as soldiers to steal some fuel for the Crimson Dawn, a gang of galactic criminals. Han tries to ingratiate himself with Beckett, but he ends up being thrown into a pit with a “monster” in chains, who eats humans. The “monster” turns out to be Chewbacca. Han convinces Chewbacca to escape the pit with him. Chewbacca agrees, and he and Han end up on Beckett’s spaceship. Han and Chewbacca introduce themselves to one another. Han tells Chewbacca his name is too long to say all the time, so he decides to call him “Chewie” for short. Han and Chewie join Beckett’s gang in carrying out a more elaborate heist, which Han hopes will give him enough money to buy his own ship and go back for Qi’ra. The heist is easier said than done. It leads to an even more dangerous challenge involving Beckett, a challenge where Han and Chewie will face some moral dilemmas that will define their character and determine their future. To complete this new challenge, they have to hire Lando Calrissian and his ship, the Millennium Falcon. Along the way, Han meets up again with Qi’ra, who’s actually become a protégé of one of the leaders of the Crimson Dawn, a ruthless criminal named Dryden Vos. The question is, can Han really trust her? SOLO: A STAR WARS STORY comes without all the Eastern, pantheistic mumbo-jumbo of “the Force” from other STAR WARS movies. Here, Han Solo must navigate a dark and dangerous criminal world where loyalty, trust, and clearly-defined moral guidelines are hard to find. When moviegoers first met Han in the original STAR WARS movie, he was a cynical smuggler seeking money. By the end of the movie, though, moviegoers learn that people mean more to Han than money. From the very beginning, SOLO shows us Han has always had an inner sense of decency; he just often hides it well, sometimes as part of a survival strategy and also perhaps as a defense mechanism. In that respect, Han shares a connection with the tough and cynical but honest private eye and police investigator in American detective melodramas, as played to perfection by stars like Humphrey Bogart (THE BIG SLEEP), James Garner (THE ROCKFORD FILES) and Steve McQueen (BULLITT). However, there’s a clear line of connection between the American detective hero and the American Western hero created by Hollywood and by writers like James Fennimore Cooper, Zane Grey, Owen Wister, A.B. Guthrie, Borden Chase, Elmore Leonard, and Louis L’Amour (of the three stars mentioned above, Bogart was the only one who never achieved success as a cowboy star). Thus, despite its allusions to American detective fiction (the movie begins with a reference to “mean streets,” the great detective writer Raymond Chandler’s description of the world in which his detective hero operates), SOLO is clearly a western in outer space, with outlaws, likeable scoundrels, menacing villains, mysterious women, and calculating good guys. In fact, that’s what screenwriter Lawrence Kasdan (who also wrote THE EMPIRE STRIKES BACK, RETURN OF THE JEDI, and RAIDERS OF THE LOST ARK for George Lucas, and who wrote and directed his own western, the acclaimed classic movie SILVERADO) says he intended while writing the script for SOLO with his son, Jonathan. SOLO is a story about what did happened before Han Solo walks through the door in the original STAR WARS movie, now subtitled A NEW HOPE. As such, it shows a character who has a good heart but hides it as best he can. Even though Han hides his good side under a cloak of reckless bravado and tough swagger, when push comes to shove, he always does the right thing, especially if the weak are being oppressed by the strong or justice needs to be done. Han’s character development helps set SOLO apart from other recent STAR WARS movies. SOLO is an exciting, fun outer space adventure. The story has lots of heart, the plot points are spot on target, the actors look like they’re having fun, and the character development is superbly written and portrayed. One of the movie’s highlights is watching Han Solo meet and interact with Chewbacca and Lando Calrissian. Alden Ehrenreich does a great job as Han, as does Donald Glover as Lando and Joonas Suotamo under all that imitation fur as Chewbacca. Emilia Clarke is appropriately mysterious, tough and attractive as Han’s first love. Also, Woody Harrelson delivers his usual charm and grit as the unreliable but personable thief, Beckett. Finally, Director Ron Howard does a fabulous job juggling all these balls and making sure that the brilliant script by the Kasdans gets the proper showcase it deserves. The editing and cinematography in SOLO are also excellent. MOVIEGUIDE® advises caution for some foul language, scary moments, scary monsters and aliens, and lots of laser battles resulting in plenty of jeopardy and mayhem. For more details about what’s in SOLO, please consult our CONTENT Section. Stealing, smuggling, criminal activity, betrayal, and criminals enslave others, but much of this is rebuked implicitly or overtly. SOLO: A STAR WARS STORY is an origin story about the iconic hero Han Solo’s first adventures. It shows how Han became a smuggler with a heart of gold, how he met Chewbacca, how he met Lando Calrissian and became owner of the Millennium Falcon, and how he and Chewie got involved with some nefarious criminal types in their first big adventure. Along the way, Han gets reacquainted with his first love, a mysterious young woman named Qi’ra. The question is, can Han still trust her? SOLO is an exciting western in outer space, with outlaws, likeable scoundrels, menacing villains, mysterious women, and calculating good guys. SOLO has lots of heart, the plot points are on target, and the actors look like they’re having fun. Director Ron Howard does a fabulous job. He makes sure that the brilliant script by STAR WARS veteran Lawrence Kasdan and his son, Jonathan, gets the showcase it deserves. SOLO has a strong moral worldview stressing do the right thing. However, MOVIEGUIDE® advises caution for some foul language, scary moments, and lots of laser battles.